I have officially lived up to my word. In early November I attended Nuffleween which is hosted by the Both Down podcast duo in Norman, OK. Lord Nuffle was apparently on my side as I managed to pick up my second tournament win in back to back outings. I brought Undead to this tournament as I had never tried them in a tournament before and wanted to give them a go. The team was named New Yorrik Hex, a play on the New York Jets NFL team and painted in their famous green and white color scheme. 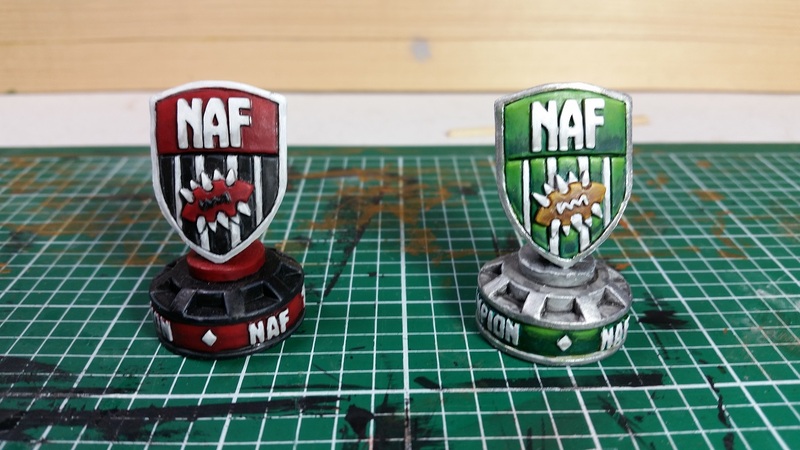 As a result, the NAF trophy was also painted in the green and white color scheme. With only two colors for the team, I had to take a little creative liberty as two colors were not nearly enough for the trophy. I added some silver and painted the ball to look like leather. I was able to play with layering and I think it turned out pretty decent. 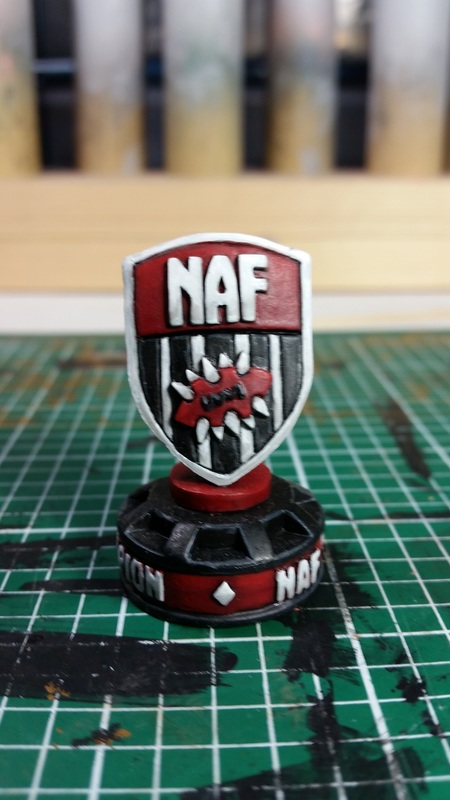 I painted another trophy for a friend in a very similar scheme right after and I think it actually turned out a little better. On a related note, with the win at Nuffleween, I was also awarded first place in the SCARS 2016 regional tournament series. First and foremost I play Blood Bowl, even in tournaments, to have fun, but I do have to admit that coming in first place in the SCARS series felt pretty good. Until the final two tournaments, I had not done exceptionally well at any particular tournament, but I had put in pretty consistent results all year. I finished 7th or higher at every tournament I attended except for the one tournament where I decided to be silly and play Ogres. It was a good year. So far, I have not really said anything about the new Blood Bowl boxed set that Games Workshop released in November. I would like to do a pretty in depth post about it eventually, but me and motivation… we will just have to see if I manage to get around to it before a post about the re-release is still relevant… if it is actually even still relevant now. One of the cool side benefits of the re-release is all the promotional goodies that come with the marketing push. I managed to get a number of small freebies, but my biggest score was managing to get my hands on both of the Gouged Eye and Reikland Reavers banners that were given to stores to promote the re-release. 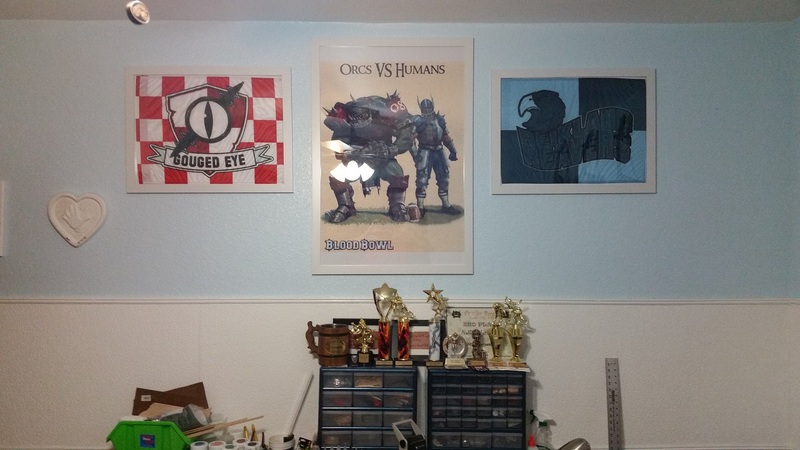 I went out and picked up frames the next day and even though they are not a perfect fit, I think the banners look pretty nice hanging on the wall. The final item for tonight’s post is to brag about how awesome my wife is. Even though my gaming hobby tends to keep me locked up alone in my office, and her alone watching TV in bed many nights, she still does really cool things for me. 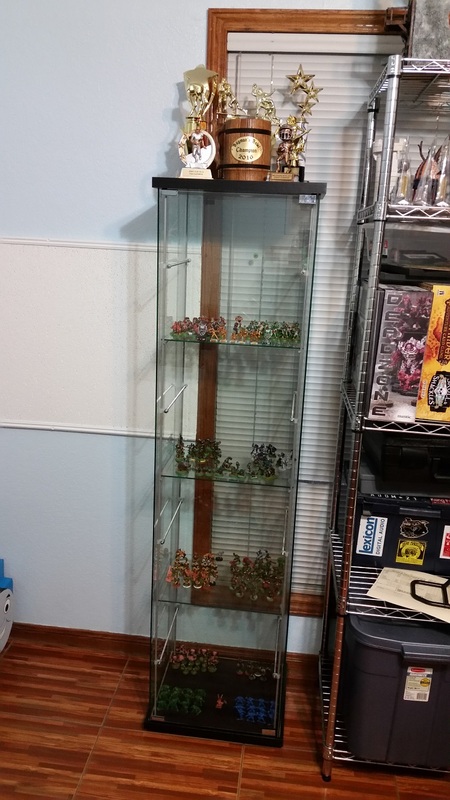 Things like getting me display case for my minis for Christmas. This is the Ikea Detolf cabinet. It is a nice unit with only one flaw for displaying minis. That flaw is that there is WAY more space in between the shelves than is needed for displaying minis. The shelves are not adjustable, but I did manage to find instructions online for adding more shelves. I have already added the supports, and gotten quotes from a local glass cutter to make more shelves. Once I get the shelves made, I have some strip LED lights all ready to go to rig up some really cool custom lighting. I will make another blog post about it once the new shelves are added and the lighting is wired in. You might also notice that all the trophies that were just below my Blood Bowl poster and banners two pics above are also sitting on top of the display case one pic above. That is because once I got the display case setup, I realized that on top of the display case was a better place for them. My four year old has started shaking my hobby table and knocked one of the trophies off of units that they were sitting on. I have no idea how, but neither the trophy, nor any of the minis on the tabletop were damaged. I decided that I had better not tempt fate and that it was best to move the trophies. 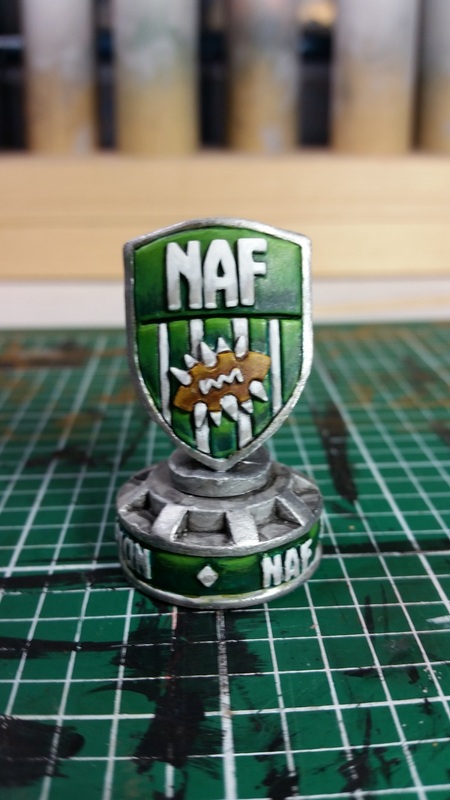 This entry was posted in Blood Bowl, Gaming and tagged Blood Bowl, Both Down, Games Workshop, gaming, Miniatures, NAF, Nuffleween, SCARS, table-top games, tabletop wargames, wargames, Wargaming by Mike C. Bookmark the permalink.